Ferrari testing their 2014 V6 Turbo at Fiorano? Whilst their rivals Renault and Mercedes have released press images and sound recordings of their 2014 'power units' Ferrari have been a little coy in releasing information on theirs. What little information we have been privy to is that it appears that Ferrari are a little wide of the mark in terms of their fuel consumption targets, even moving to have the 100KG limit per race lifted. Renault were the largest opposer to a moving of the goalposts with an additional 20kg's of fuel touted as the figure requested by Ferrari. It's widely regarded that Mercedes are also very marginal in their race simulations and so were sitting on the fence during discussions. 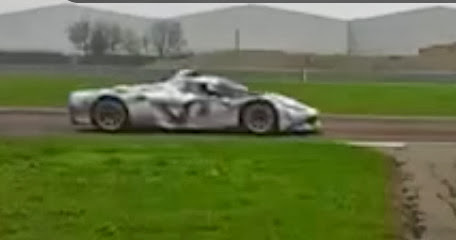 The following video surfaced today of what appears to be either a FXX or LaFerrari lapping the Fiorano test track with a distinctly un-Ferrari like turbo sound and certainly isn't representative of the V12 core engine either of the aforementioned usually run. It's certainly an interesting idea if Ferrari have decided to use LaFerrari as a mule especially as Rory Byrne helped design the carbon fibre chassis for the car that adds 1/5th of torsional rigidity over the Enzo and now resides on the Formula One team looking to return to winning ways. I'm not suggesting that the use of the new F1 engine housed within a road going chassis would be an easy one to pull off either but it would certainly assist in allowing some actual track running prior to pre season testing which is still a few months away. It would most certainly require the whole rear end of the F1 car's power unit, gearbox and suspension to be bolted to the monocoque too. In terms of integration it's also worth noting that it would appear a roof snorkel has been mounted to the top of the car replicating the airbox position on an F1 car that doesn't usually appear on the FXX/LaFerrari. If this is Ferrari finding a way to test outside of the testing restrictions then fair play to them, it's an expensive operation that isn't representative in terms of loadings etc because they are running on track/road tyres rather than F1 style tyres. However real world running in any form has to give some feedback that might not be attainable through simulation and bench testing. Don't see any reason why not - they are allowed to test using 2011 F1 cars as long as they aren't substantially altered so a road car with an F1 engine (which isn't under any restrictions in terms of development yet) doesn't seem like it would contravene any rules. 22.1 Track testing shall be considered any track running time not part of an Event undertaken by a competitor entered in the Championship, using cars which conform substantially with the current Formula One Technical Regulations in addition to those from the previous or subsequent year. Well if you happen to be developing a 1.6l V6 Turbo road car then it can't be illegal can it? Provided the components are intended for the road car. The only issue I can think of is that they'd not be able to run a MES ECU? Ferrari as a manufacturer would have access to the MES ECU for testing, nothing stipulates that it must be a bench test..
F1 test restrictions in order to lower the expenses are stupid. And this is a proof of it. In a time when the regulation changes are massive you have to be flexible regarding the track tests. One last consideration I missed when I wrote this article last night was that Ferrari are also going to use a 1.6 V6 Turbo unit in their LMP car. Although it would be a close relative to the F1 counterpart there would be differences in it's makeup. It is therefore plausible this is a test mule for that engine too. Ferrari being a manufacturer would have access to the MES ECU for testing, nothing stipulates that it must be a bench test.. Such an amazing blog about the Turbocharger recondition Sheffield and I really appreciate you work which you have done well.